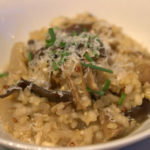 Risotto is one of my ultimate comfort foods, smooth, creamy and packed with flavour it is a real hug in a bowl. The ritual of making it is a comfort in itself; the half hour of gently stirring the rice, forces you to slow down, relax and put the stresses of the day behind you and possibly enjoy a glass of wine. In this version I have added quinoa and bulgar wheat to the mix, adding different textures and flavours, bumping up the protein content and lowering the GI, without losing any of the comfort of the original dish. 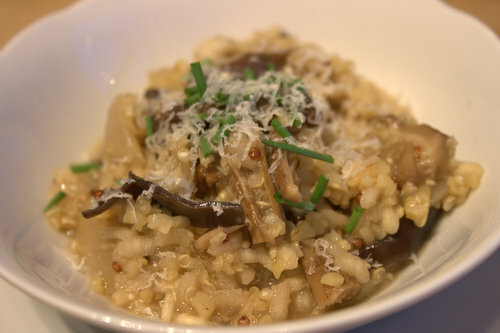 As with any risotto there are no limits to flavours, I used a selection of dried mushrooms I was sent from Cooks & Co. Sometimes you can find sand in dried mushrooms so you may need to rinse them carefully after soaking, and strain the soaking water through a fine sieve. If you try this Recipe: Mushroom & Mixed Grain Risotto please tag #FussFreeFlavours on Instagram or Twitter. It is amazing for me when for me when you make one of my recipes and I really do love to see them. You can also share it on my Facebook page. Please pin this recipe to Pinterest too! Thanks for reading Fuss Free Flavours! Place the dried mushrooms in a jug and cover with about 250ml / 1/2 pint / 1 cup of boiling water. Leave to soak for 10 minutes. Fry the onion and garlic in the oil for a few minutes until soft, add the rice and fry until it is translucent. Strain the mushrooms, saving the soaking water. gradually add the mushroom water, then the stock to the rice, stirring all the time until it is absorbed before adding some more water. After about 7 minutes add the quinoa and bulgar wheat. Finely slice the mushrooms and add them to the pan. continue to add the liquid, add a spash of wine and/or a dash of mushroom ketchup. Season to taste. After about 30 minutes of gentle stirring it should be done, the grains soft coated in a creamy, starch sauce. Serve immediately garnished with parmesan and chopped chives.